Another postcard showing the same view as picture #1614 and this one is dated 23/12/1914. It was sent from "Rockfields" Saltburn to Mabel Jamieson, London. The message reads "Behold my Village - it is easily a mile long" - still no electricity/telegraph poles. In 1923 there was no water supply to houses on beach side of road. Road still looks like it is of compacted earth. I can remember my grandparents having electricity installed in mid 50's. I did my homework by light of Tilly Lamp. Regarding picture #1614: second house no longer thatched and has added upper storey. Telegraph/electricity poles now visible and road surfaced. All houses had grass outfront where now there is pavement. An interesting set of postcard images of same view. Lovely pic! "Rose cottage" (my grandparents post mid '60s) is I think the 3rd house along in this photo. Geordie Davidson's cottage was set back a little hence not actually visible here. I remember him and the punts which he launched via rollers on the shoreline. Grass verges ie no pavement was still the case in the mid '60s as I remember! A Mrs Dean I vaguely recall c1960s. A Mrs Watson and also a Colin Watson also. Not sure if "Rockfields" survives? The only place with a wall like that is the old school Saltburn, and that would make the house with the gable end Nan and Dennis Cahill's. Eighteen-year-old John Allan McLoughlin, Rockfield, Saltburn, has been appointed on probation to a Permanent Commission in the Secretarial Branch of the Royal Air Force. After initial training at the Officer Cadet Training Unit, RAF Henlow, Bedfordshire, he will attend Aberdeen University. Rockfield was the house the McLoughlin's lived at in the ’60s. 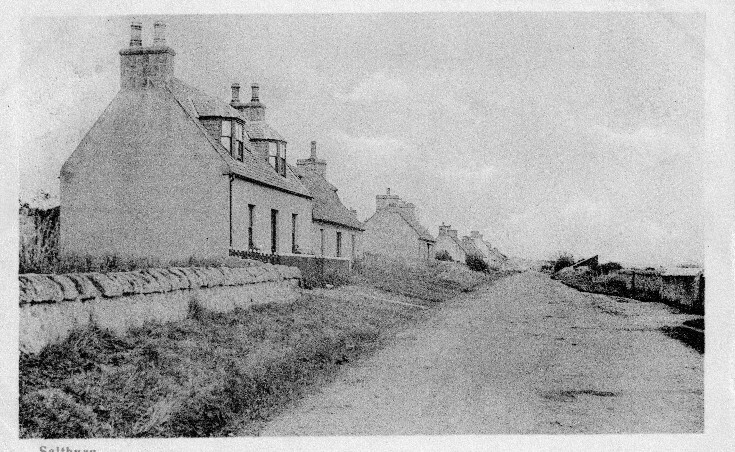 Above is from the Ross-shire in 1968. Not sure who lived there before that. So Rockfield is much further along the village from the " Schoolie". Allan was in my class at school and if I remember correctly the family lived at the other end of the village from the school. My brother Cam thinks the Garsons lived in Rockfield before the McLoughlins but moved to the "New Houses" built by Ross & Ross (now numbered 70 and 71) in the '60s. Yes David you are right I think. Rockfield always had a wooden chest/seat on the pavement outside the garden wall and I remember it as being the Garsons. The Mcloughlin family lived there after, I was in school with Andrew the younger son.